The 105m2 space was formally a bar and café with half of the space taken up by an enclosed kitchen area. 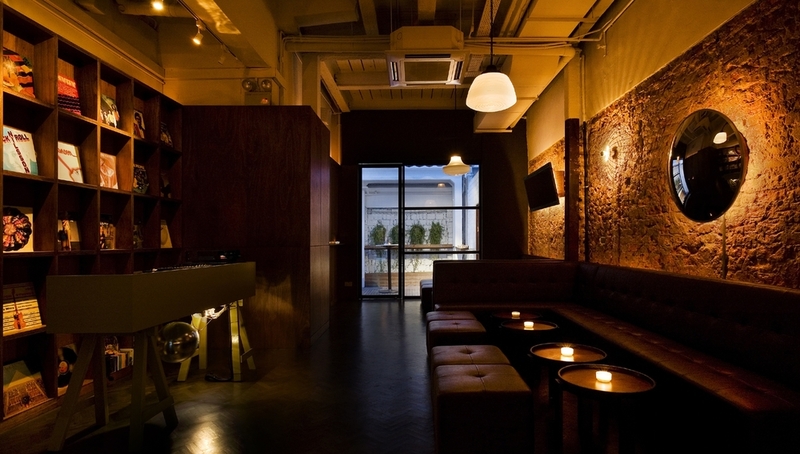 The brief was to convert the space into a lounge/ cocktail bar that could be connected to the adjacent club next door. The kitchen and enclosing walls were removed and the back wall replaced with full height steel-framed glazing onto to the small outdoor courtyard. The entrance to the bar was from a narrow corridor, and so this was emphasised by cladding the wall with timber panelling and customized wall lamps. The serving bar was located close to the entrance and built-in lounge seating added next to the courtyard window. The bar has a richly veined marble top and clad with reclaimed timber slats at the sides. The back bar display consists of a series of copper clad boxes with mirror and integrated lighting for the bottle display. The DJ area is located next to the lounge and fabricated from a customised trestle table with a rotating disco ball below. Behind the DJ table a shelving system was designed to display a collection of retro album covers. An opening was made in the wall between the bar and club and a hidden secret door added in the timber panelling that connects through to the “PLAY” club space at the weekends.